Carpets are the most common decorations in every household in the world. Aside from being a decor, they also have a protective role: they keep the feet warm from the cold floor underneath.There’s a huge variety of carpets on the market, and some of them can be quite expensive. In the 2000s, carpets were used in commercial buildings, as well as residential. The most famous and expensive carpets in the world are the Persian carpets, made in Iran and other countries which belonged to Persia. Many of those carpets are kept in museums and private collections, as real pieces of art. It is believed that the first carpets appeared around the second millennium BC in East Asia, although remains of woven sheep wool date from the 7th millennium BC. Unlike modern carpets from the 21st century, which are made of synthetic fibers, in the past, the rugs were made of natural materials. These ancient carpets were normally a subject of deterioration and destruction by rodents and insects, so it’s no wonder that only a few are preserved. 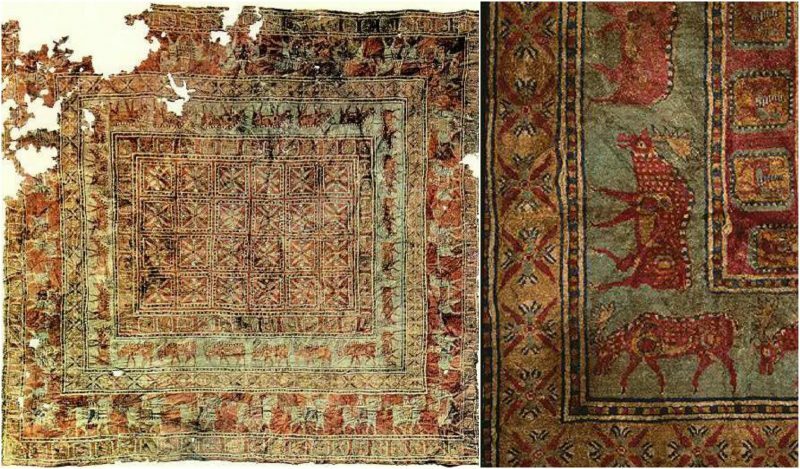 The oldest carpet in the world is the Pazyruk carpet, which was found in 1949 by Sergei Rudenko, a Russian anthropologist, and archaeologist. 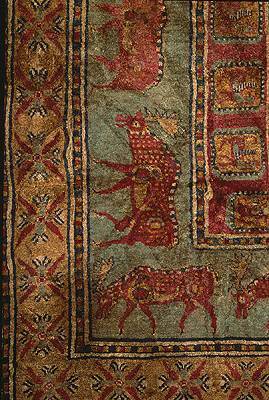 The carpet was found in the Pazyryk Valley in Siberia, in the Altai Mountains. 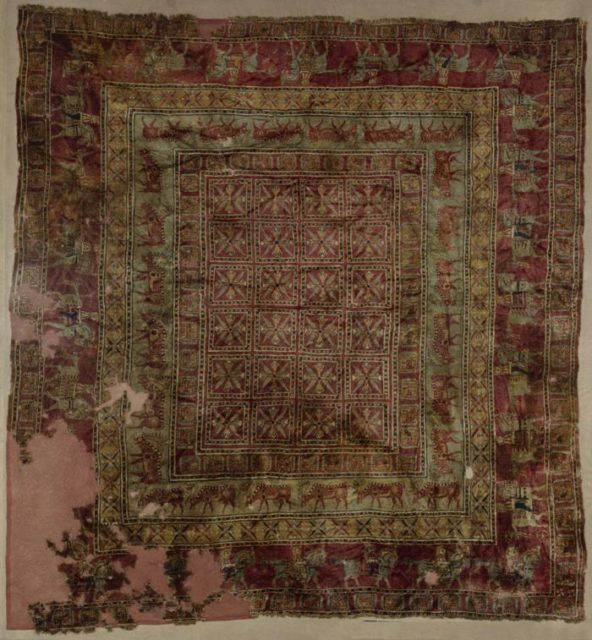 Excavated from the grave of a Scythian nobleman, the radiocarbon tests proved that the carpet was produced in the 5th century BC. Although very old, the weaving technique used on this carpet is very advanced, and it shows a long tradition in carpet production. The Pazyruk carpet has 36 symmetrical knots; it is 9.2 ft (283 cm) long and 6.5 ft (200 cm wide). Its pattern is colorful and lavishly decorated with a deep red central field. 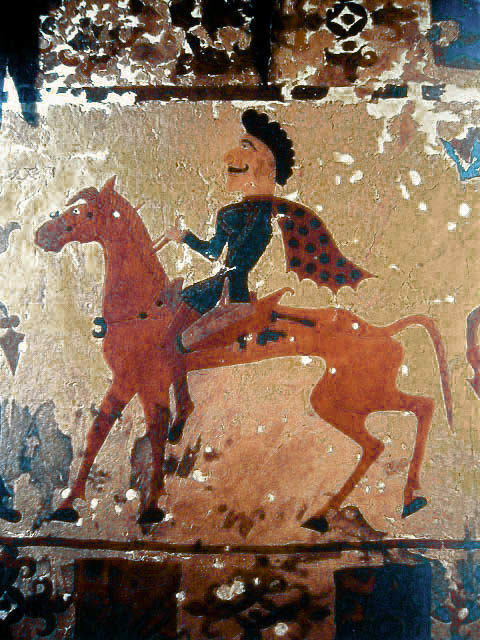 The inner main trimming has deer images, and the outer depicts men on horses. The middle is filled with rectangles decorated with X-shaped ornaments., stars and cross-shaped patterns. Trimmings divide the central and outer parts. This design with repetitive patterns is a standard in the oriental carpet production, found on many other rugs from this territories. The carpet was found in a remarkably preserved tomb. It was discovered among well-preserved mummies, a burial chariot, cannabis seed and various figurines. The bodies were well preserved in ice, so their tattooed flesh and their hair remained intact. 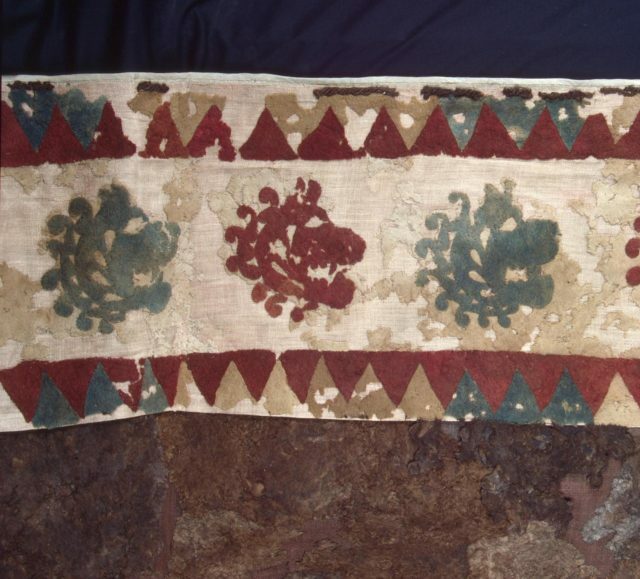 However, the carpet was the most valuable item which has been discovered in the tombs. The Pazyryk valley was located on a very active trade route which connected China and Central Asia. Traders from all the world traveled through the valley, so the origin of the carpet remains unknown. It is almost certain that it wasn’t made by the people inhabiting Pazyryk, as they never produced rugs so sophisticated. It is believed that the carpet came from Central Asia, Armenia or Persia. Both Armenians and Persians have a long history in weaving beautiful carpets. The decorations found on the Pazyryk carpet are almost identical to those found in Persepolis, a city in Persia, so Persians claim the carpet as their own. Meanwhile, a textile expert made a conclusion that the carpet was made in Armenia, based on his examinations. So, the two nations have a clash over the origin and ownership of the Pazyryk carpet. Today the carpet is displayed at the Hermitage Museum in St. Petersburg, Russia, and wherever it was produced, remains as one of the most beautiful and significant artistic discoveries.